The call to be a prophet is more than an invitation. It is first of all a feeling of being enticed, or acquiescence or surrender. But this winsome feeling is only one aspect of the experience. The other aspect is a sense of being ravished or carried away by violence, of yielding to overpowering force against one’s own will. . . .
A man [sic] whose message is doom for the people he loves not only forfeits his own capacity for joy, but also provokes the hostility and outrage of his contemporaries. The sights of woe, the anticipation of disaster, nearly crush his soul. 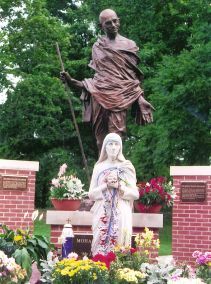 The Peace Abbey in Sherborn Massachusetts, dedicated to understanding and fostering peace in its many forms, has organized a Pacifist Memorial which includes a series of walls radiating out from a statue of Gandhi. Each wall contains plaques honoring a peacemaker with a short quote from that person’s life. Many are known, like Mother Teresa and Dorothy Day, while others are relatively unknown like Jessie Wallace Hughan (Founder of the War Resisters League) and St. Catherine of Siena (political and religious Peacemaker, 1347-1380) Notably missing from this assembly is Rachel Corrie. The process for adding her includes submitting a proposals about her life and work, why she is a peacemaker, and then, if the application is accepted, raising the money to pay for the plaque ($150 – 300). I encourage any reader who’d like to support this proposal to write Lewis Randa, founder and director of the Peace Abbey, at lewisranda@gmail.com. Proposal accepted. 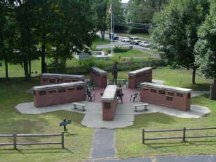 I’m raising money for the memorial plaque. If you wish to donate please contact me, Skip Schiel, at schiel (at) ccae (dot) org. I’m writing to propose adding Rachel Corrie to a wall of the Pacifist Memorial. She was a nonviolent activist from the USA working in Palestine, who, while trying to protect a Palestinian home in Gaza from demolition by the Israeli army, was killed. A Caterpillar D9 bulldozer (made in the USA) driven by two Israeli soldiers crushed her. Many eyewitnesses claim that the soldiers saw her and deliberately killed her. She was working with the International Solidarity Movement, a Palestinian-led organization dedicated to non-violence. After her training in non-violence, Rachel lived with various families in Rafah for about 5 weeks prior to her death. She wrote profusely. A play seen around the world, My Name is Rachel Corrie, memorializes her words and life. 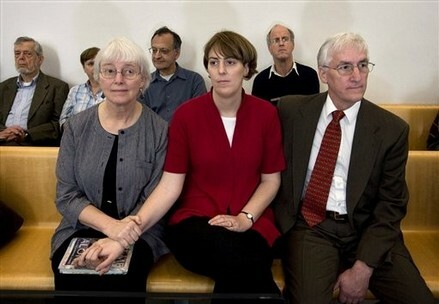 A district court in Haifa is now (March 2010) hearing her family’s case against the Israeli state for wrongful death. And March 16, 2010 marks the 7th anniversary of what Palestinians and many others including me consider her martyrdom. I’m here for other children. I’m here because I care. I’m here because children everywhere are suffering and because forty thousand people die each day from hunger. I’m here because those people are mostly children. We have got to understand that the poor are all around us and we are ignoring them. We have got to understand that these deaths are preventable. We have got to understand that people in third world countries think and care and smile and cry just like us. We have got to understand that they dream our dreams and we dream theirs. I do this on behalf of a larger community who share my views about her non-violent peace making, and I’m preparing to raise the funding necessary for the plaque. I have been in Palestine for two weeks and one hour now, and I still have very few words to describe what I see. It is most difficult for me to think about what’s going on here when I sit down to write back to the United States. Something about the virtual portal into luxury. I don’t know if many of the children here have ever existed without tank-shell holes in their walls and the towers of an occupying army surveying them constantly from the near horizons. I think, although I’m not entirely sure, that even the smallest of these children understand that life is not like this everywhere. We should be inspired by people… who show that human beings can be kind, brave, generous, beautiful, strong—even in the most difficult circumstances. I should at least mention that I am also discovering a degree of strength and of basic ability for humans to remain human in the direst of circumstances – which I also haven’t seen before. I think the word is dignity. I wish you could meet these people. Maybe, hopefully, someday you will. Many people want their voices to be heard, and I think we need to use some of our privilege as internationals to get those voices heard directly in the US, rather than through the filter of well-meaning internationals such as myself. I am just beginning to learn, from what I expect to be a very intense tutelage, about the ability of people to organize against all odds, and to resist against all odds. 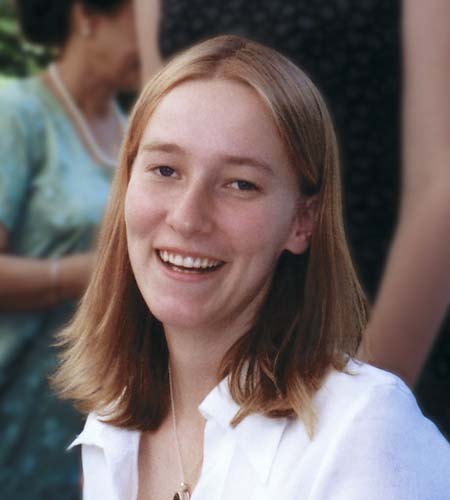 Rachel Corrie should be honored and memorialized for her ideals and actions. Justice was her cause during her teen age years and was unflagging as she stood with arms raised as the caterpillar moved towards her. Rachel Corrie’s life continues to inspire and motivate people of peace. Her values and actions were entirely consistent with those of the Peace Abbey. She should have a permanent recognition there. People deserve to be reminded of Rachel Corrie’s courage and action amongst all the others at The Peace Abbey’s Pacifist Memorial.